Sterling was able to retrace the losses it had accumulated during the course of yesterday almost in their entirety but was unable to appreciate significantly beyond that. Please be noted that GBPUSD and EURGBP pairs flash implied volatility (IVs) numbers at 12.5% and 11.5% respectively, which are the highest among the G10 FX space (refer above nutshells). The IVs at the short end did not ease at all but instead rose further (refer 1st chart). That does not surprise as the market never believed in a no deal Brexit on 29th March in the first place otherwise the still relatively high GBP levels would be completely unjustifiable. Instead, the FX market is now finally in a position to allocate a clear date to the Brexit risks, we will finally know where we stand within the next three weeks. 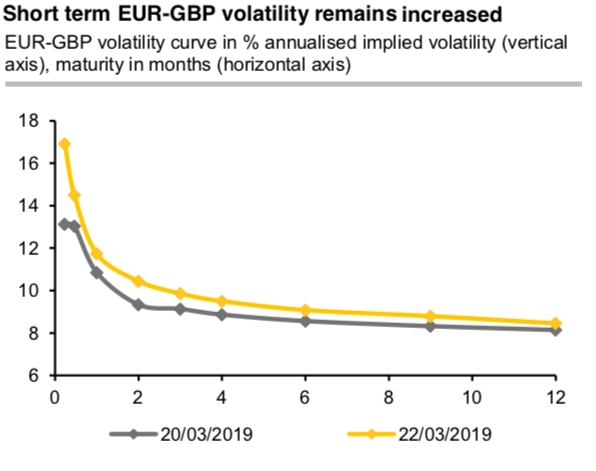 This realization had considerable effects on the options market: EURGBP risk reversals, which represent the cost differential between hedging against a weaker or stronger pound shot up significantly yesterday across all tenors (refer 2nd chart). That means the FX market clearly now sees a higher likelihood of Sterling collapsing, even if the spot rate is not yet reflecting an increased no deal risk. Currency Strength Index: FxWirePro's hourly GBP spot index turns -21 (which is mildly bearish), while hourly EUR spot index was at -62 (bearish) at 13:05 GMT.